From an early age children begin to learn about the concept of taking away. Singing songs such as ‘Ten Green Bottles’ really helps them to understand that when something goes there are less left behind; equally 'Five Little Monkeys', 'FIve Little Ducks' and 'There were ten in a bed' help practise the process of subtracting one each time. It is also a good idea to encourage your child to count backwards every now and again, so that they are aware of how to work out the number before a given number. Start by counting backwards from 10, then move onto 20, then start with higher numbers as they get more confident. Whenever possible try and point out the concept of subtraction in everyday situations. If there are four birds in the garden, then one flies away, ask, “How many now?” and count them together. Of course, we tend to do this type of thing naturally with our children anyway, but making a conscious effort to model the counting and to use the correct vocabulary can really help them when they come to learning subtraction in a slightly more abstract way later. The use of chocolate is also a great motivator! Count out ten (small!) chocolates and then say to your child: 'How many will there be if I eat two?' If your child gets confused, show them how to move two away and then count the remaining ones. Let them eat the two chocolates once they have got the hang of this. Continue with the remaining chocolates: 'How many will there be if I eat three?' etc. how many are left/left over? how many fewer is.. than...? What is 5 minus 3? If I subtract 4 apples from the bowl, how many will there be left? What is the difference between 7 and 11? Number lines can be extremely useful in subtraction. Children will learn how to use them accurately at school, so make a few at home to have to hand when they’re stuck. It’s not cheating, it’s learning to use tools to help, and number lines help them learn more deeply about the operation involved. As they get older empty number lines can become more appropriate. Still write on 0 at the end, but let the child draw on the numbers they need for the calculation, spacing them out at accurately as they can. They may learn to ‘bridge through 10’ in subtraction, so that they jump back 10 (instead of counting back 10, one number at a time). They can jump to 37, then count back a further 9. 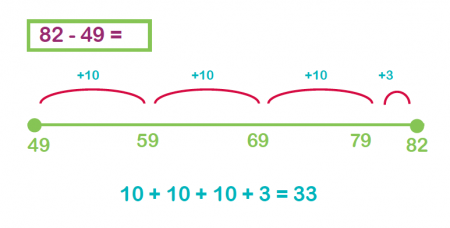 Alternatively, you could use a number line for subtraction with the 'complementary addition' or jump strategy method. So, if you have to work out 82 - 49, you put the 49 at the start of the number line and then jump up to 82, adding all the jums together to find the difference between 82 and 49. Word or story problems are always useful to help children understand why we need to learn mathematical concepts, and play a big role in both KS1 and KS2 SATs. It’s vital that children understand how to analyse a story problem, taking note of the aspects in the problem that are irrelevant and those that are vital to the calculation. There were 8 children at the party. Two went home. How many are left? Underline the numbers and the question before showing your child how to write the problem as a number sentence (8 - 2 =). If your child struggles with this, it could help to use eight objects (small toys, pasta shapes, counters) or you could show them a ruler or number line and get them to point at 8 and then count back 2. There are 25 sweets. Kim takes 11 and Amit takes 9. How many sweets are left? Nan bought a 2 kg bag of leeks. She used 400 grams of leeks to make some leek and potato soup. How many grams of leeks were left? It can be helpful to teach the inverse using small counters, showing your child a pile of 6 counters and a pile of 4 counters, explaining that altogether they make 10. You could then put them together and then pull 4 away, demonstrating that 10 - 4 = 6. Put them together again and pull 6 away, demonstrating that 10 - 6 = 4. Once you think your child has understood this concept, show them a number sentence, such as: 7 + 5 = 12. Ask them to write it as a subtraction number sentence (12 - 5 = 7). Practise this as often as you can. It takes a while to get the hang of it, but it is a really important concept to know to help them gain a deeper understanding of the number system and become independent learners who can check their own calculations. By the end of Year 2 children should feel confident about adding and subtracting from any given number up to 100. To build this confidence it’s helpful to use a 100 square so they can see how it works. So for subtracting 10 they move up a row from a number (rather than counting back 10), subtracting 20 is simply moving up two rows, and so on. You could also invest in some deines blocks and use them to demonstrate various subtractions, such as 59 - 30 or 84 - 50. 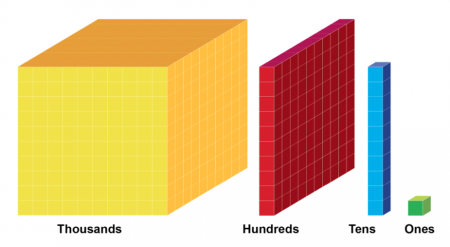 Show your child how to make up the large number using ten sticks and unit cubes, then show them how to take away the multiple of ten (3 ten sticks if they are taking away 30, 5 ten sticks if they are taking away 50, etc.). In Years 3, 4, 5 and 6 children work on more complex subtraction calculations and problems.They’ll be encouraged to record their calculations properly, consistently and clearly. They’ll start using much higher numbers, negative numbers and decimal numbers. Increasingly the subtraction (and addition) calculation will form part of a more complex problem-solving task. Once children are dealing with larger numbers and decimal numbers, it can be helpful for them to move onto using the column method which involves 'borrowing' numbers. This is a quicker method than using a number line. I have £6390 in the bank. I spend £3980 on a new car. How much money do I have left? What is 1.6 take away 0.8? I have 2.1 litres of orange juice. I pour out 360ml. How much orange juice do I have left? A triangle has two angles of 81˚ and 36˚. How big is the third angle of the triangle?